OVERLAND PARK, Kan. — This month, as part of the city's 2019 budget, the Overland Park City Council approved just more than $50,000 in new funding for the city's fire department. It's specifically meant to improve cancer-reduction strategies, but the funding is just the first step in a long-term goal to protect firefighters from dangers they can’t even see. When firefighters go into a burning building, they wear a piece of equipment called a hood. It’s literally wrapped around their head, making direct contact with their face and neck. "After a fire, it'll be blackened, it'll be sooty,” OPFD Capt. Andrew Grove said. “It'll be covered in...products of fire." With these new funds from the city, the department will be purchasing new hoods that are designed to block much more of the chemicals in the smoke that these men and women wade through every day, for decades in some cases. "Looking at them from a distance, there is no recognizable difference between the two hoods,” Grove said. “But when you feel them and hold them, you can tell that one is just a more robust hood." “I wish we had done a lot of this 30 years ago,” OPFD Battalion Chief Mark Messinger said. But fighting cancer in the department can't just be about cleaning the exterior of the uniform after a fire. It’s also about changing the entire mindset of what they're carrying home with them, the threats that are seeping right into the seats of their own fire trucks. 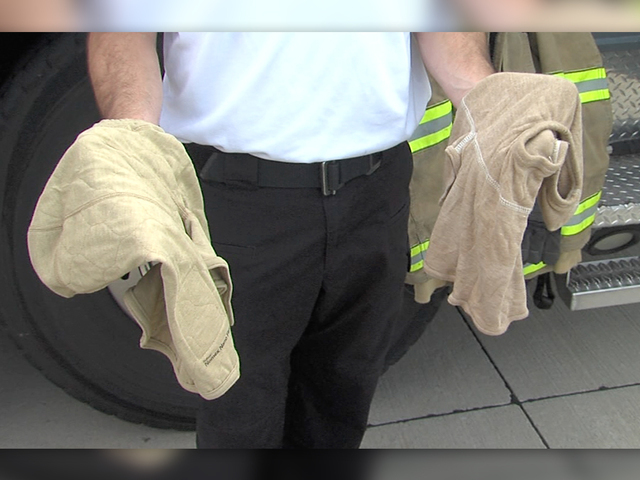 That's why fire departments, including Overland Park, are now taking extra steps, like purchasing two sets of gear, so firefighters always have a clean one to wear. And, they're planning for the future, including buying machines to properly clean all that gear. “We just have to get out of that mindset of, 'I'm going to take care of me last,'” OPFD Chief Brian Dehner said. Just last week, the Greater Kansas City Firefighters, Local 42, posted on its Facebook page honoring the life of North Kansas City Fire Captain Mark Skeens, who died from occupational cancer in July. He's not alone. The National Institute for Occupational Safety and Health found that firefighters had higher rates of several types of cancers, and of all cancers combined, than the U.S. population as a whole. Dupin said losing a firefighter, no matter the cause, feels like a failure, and he's pushing for more awareness of just how dangerous fires can be years after they've burned out. In July 2018, President Donald Trump signed the Firefighter Cancer Registry Act into law. It requires the Centers for Disease Control and Prevention to create a voluntary registry of firefighters , including the number and type of fires each firefighter attended. It will be used to monitor cancer in the profession.